Each of these photos can enlarged by clicking on them. Use your browser's return button to get back to this page. If you get the idea we like dogs and camping - you're right! There are more photos in the Genealogy pages. Betty's dad, "Bud" and his wife Dorothy at his 78th birthday party. Betty and her daughter, Tracie, are shown too. Ray and his son, Steve. 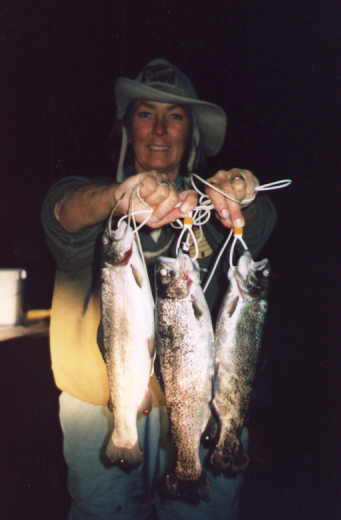 Betty had a great day fishing near Tahoe. 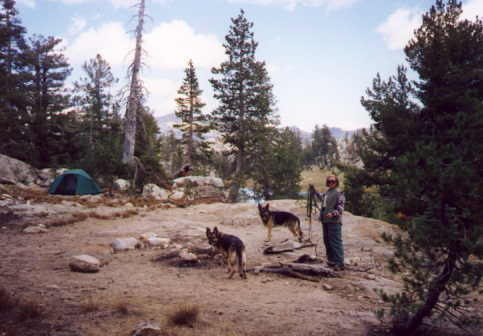 We'd spent a week camping with our dogs at Snow Flower. We hiked 12 miles into the Emigrant Wilderness near Yosemite. Here's our campsite at 9,000 feet. Absolutely quiet with not a soul around. Wonderful! 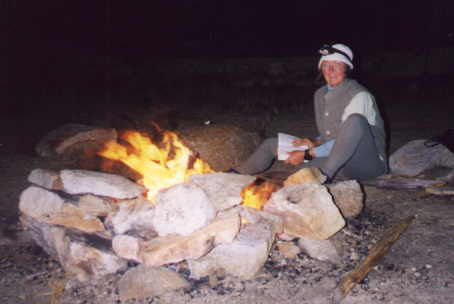 After a long day of hiking, nothing beats roasting marshmallows, a hot cup of chocolate, and a book!